Whenever you are looking for a popular cargo van and passenger wagon, the Ram ProMaster City should top your list. 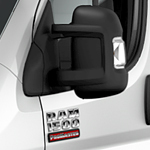 This cargo van serves as one of the most popular on the market today because of its capability features. Every car and truck touts its features, but this truck is one of the few that actually delivers everything it promises. One thing that makes it unique is its towing capacity; at 2,000 pounds, it is the best in its class. Another thing that makes it stand out from other trucks in its class is the fact that it has a cargo capacity of 131.7 cubic feet with an uninterrupted rear cargo floor. This makes it easy for you to transport a lot of little things or a few big things. If you would like to know more about all the Ram ProMaster City has to offer, then visit our Dodge showroom at The Razzari Auto Centers as soon as possible!